Most of Papua New Guinea’s past development plans and agreements were negotiated well enough, resulting in the country offering very favorable tax concessions which are not right. 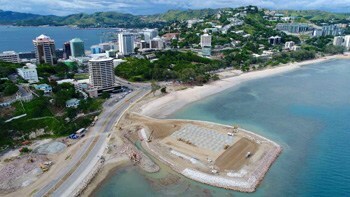 Prime Minister Peter O’Neill admitted this during the National Planning Consultative Summit in Lae today and vowed to revisit and review every development agreements. Serving his seventh year as PM, the Ialibu-Pangia MP said much of PNG’s problems today is not the doing of its own leaders especially in the past years. Mr O’Neill told the audience at the summit that there is admittance that the country is so resource rich, but its people are still poor, its because of the resource development agreements that have been signed before. “Its not to say that we are trying to blame some of our own leaders in the past, they were not educated enough to understand so they sign agreements that were not favorable to our country, parking all these export revenues overseas, not bringing foreign currencies back into the country. “Our intention is not to try and tear up the agreement, we want a fairer share for our people, that’s all we want, fairer share,” he said.